In the 1990s, the use of biological weapons by terrorists became a serious threat to the security of countries around the globe, and the United States in particular. During the Gulf War of 1990 to 1991, and in subsequent United Nations inspection efforts, the government of Iraq's development of advanced anthrax based bioweapons was revealed. Although the incidents have not been directly linked, following the September 11, 2001 terrorist attacks on the World Trade Center buildings in New York City and the Pentagon in Washington, D.C., anthrax was used as a bioterrorist weapon. Letters containing a powdered form of Bacillus anthracis , the bacteria that causes anthrax, were mailed to representatives of government and the media, among others. Multiple attacks eventually killed five people. Anthrax refers to a disease that is caused by the bacterium Bacillus anthracis . The bacterium can enter the body via a wound in the skin (cutaneous anthrax), via contaminated food or liquid (gastrointestinal anthrax), or can be inhaled (inhalation anthrax). The latter in particular can cause a very serious, even lethal, infection. The disease has been present throughout recorded history. Its use as a weapon stretches back centuries. Hundreds of years ago, bodies of anthrax victims were dumped into wells, or were catapulted into enemy encampments. Development of anthrax-based weapons was pursued by various governments in World Wars I and II, including those of the United States, Canada, and Britain. Humans naturally acquire anthrax from exposure to livestock such as sheep or cattle or wild animals. The animals are reservoirs of the anthrax bacterium. 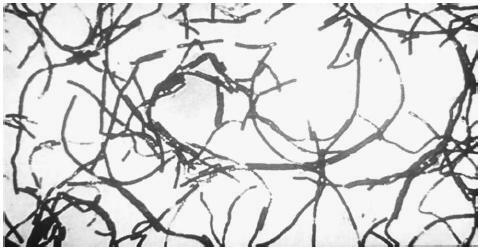 A microscopic view of the anthrax bacteria is seen in this photo from the U.S. Army Medical Research and Development Command at Ft. Detrick, Maryland. While all three types of anthrax infections are potentially serious, prompt treatment usually cures the cutaneous form. Even with prompt treatment, the gastrointestinal form is lethal in 25%–75% of those who become infected. The inhaled version of anthrax is almost always lethal. When Bacillus anthracis is actively growing and dividing, it exists as a large "vegetative" cell. But, when the environment is threatening, the bacterium can form a spore and becoming dormant. The spore form can be easily inhaled. Only 8,000 spores, hardly enough to cover a snowflake, are sufficient to cause the inhalation form of anthrax when the spores resuscitate and begin growth in the lungs. The growing Bacillus anthracis cells have several characteristics that make them so infectious. First, the formation of a capsule around the bacterium can mask the surface from recognition by the body's immune system. The body can be less likely to mount an immune response to the invading bacteria. Also, the capsule helps fend off antibodies and immune cells that do respond. This protection can allow the organism to multiply to large numbers. The capsule also contains a protein that protects the bacterium. This "protective antigen" dissolves other protein molecules that form part of the outer coating of host cells. This allows the bacterium to evade the host's immune response by burrowing inside host cells such as the epithelial cells that line the lung. A toxic component called lethal factor actively destroys the host's immune cells. Finally, another toxic factor called the edema factor (edema is the build up of fluid at the site of infection) disables a host molecule called calmodulin. Calmodulin regulates many chemical reactions in the body. With the various toxic factors, Bacillus anthracis is able to overcome the attempts of the host to deal with the infection. Bacterial toxins enter the bloodstream and circulate throughout the body. The destruction of blood cells and tissues can be lethal. The early symptoms of anthrax infections are similar to other, less serious infections, such as the flu. By the time the diagnosis is made, the infection can be too advanced to treat. This can make the recognition of a deliberate anthrax attack difficult to recognize until large numbers of casualties have resulted. While the bacteria can be killed by antibiotics, in particular an antibiotic called ciprofloxacin (cipro), the antibiotic needs to be administered early in an infection. The ease by which anthrax can be transported (i.e., via the mail) has made anthrax a weapon of frightening severity. A vaccine for anthrax does exist, although the possibility of serious side effects has limited its use to only those at high risk for infection (i.e., soldiers, workers in meat processing plants, anthrax researchers). Vaccine researchers are exploring the possibility that the edema factor and the capsule could be exploited as targets of vaccines. The idea is that the vaccines would stop the bacteria from getting into host cells. This would make it easier for the immune response to kill the invading bacteria. Heyman, D. A., J. Achterberg, and J. Laszlo. Lessons from the Anthrax Attacks: Implications for U.S. Bioterrorism Preparedness: A Report on a National Forum on Biodefense. Washington, DC: Center for Strategic and International Studies, 2002. Jernigan, J. A., D. S. Stevens, D. A. Ashford, et al. "Bioterrorism-Related Inhalational Anthrax: The First 10 Cases Reported in the United States." Emerging Infectious Diseases no. 7 (2001). Centers for Disease Control and Prevention. "Anthrax." Division of Bacterial and Mycotic Diseases. October 30, 2001. < http://www.cdc.gov/ncidod/dbmd/diseaseinfo/anthrax_t.htm >(9 December 2002).